I bet you ddtint konw taht I culod saepk in cdoe did you? Sokchnig as it may be, I am satmrer tahn I look! Tihs is atcaluly pterty fun! If you can raed tihs, I gesus you are ptrety sarmt too! I wndoer if I wtire lkie tihs mroe otefn, if my barin wlil wrok bteter? It mhgit hlep me rmembeer the nmae of the cihld im hlolrenig at! You konw..wihuott ylelnig out trehe ohetr nmeas frsit! Mkaes ya wndoer if we ralely ndeeed all tsohe sleplnig tsets in socohl? 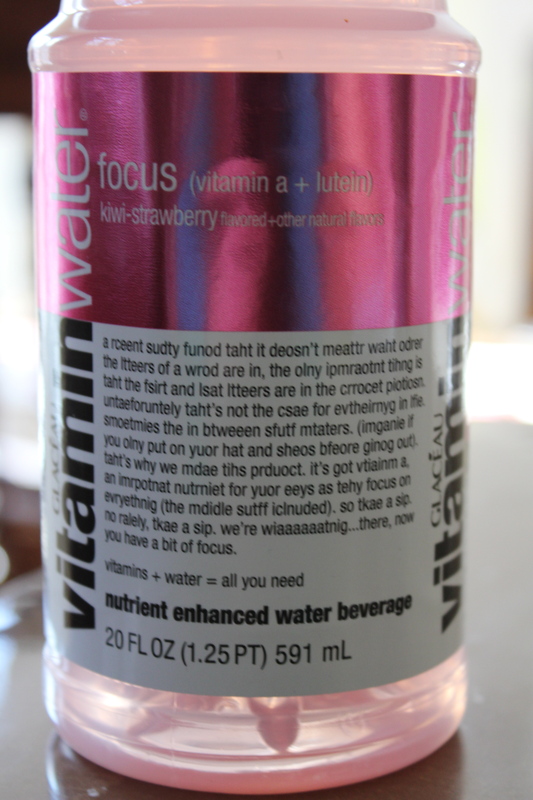 No… tihs wsnat my ieda…Vitamin Water baet me to it! Petrty cool rhigt? I drank the whole bottle and………..Nothin! I still called Nora.. Henora! Although, I was able to change a poopie diaper and dirty onesie while wrangling a rolling baby all while talking on the phone! Maybe it did help me focus….or maybe I’m just that good! This ain’t my first Rodeo ya know! 🙂 And Yes, I did say I was on the phone, and NO I couldn’t just put it down…I was talking to someone from the ‘outside’….I’m not giving THAT up that easily!! All you veteran Stay-at-home Mom’s out there know just what I’m talking about…..right?